In 1919 the site was known as Brownhills Chemical Works. 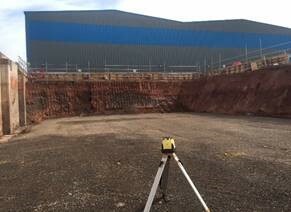 Castings PLC is undertaking site improvement works including the construction of a warehouse extension. Envirotreat was contracted by Seddon Construction Limited to design and implement the required remediation works in the area of the warehouse extension building footprint – these works included the cost-effective management of soils / materials on-site and off-site disposal of surplus soils and materials. Site investigations had identified contamination within the made ground – the prime contaminants of concern were metals (copper, lead and zinc) and petroleum hydrocarbons. Code of Practice [DoWCoP]. Envirotreat produced a Materials Management Plan [MMP] in accordance with the previously agreed Remediation Strategy to effectively manage the cut and fill element of the enabling works. On completion pf the remediation works, Envirotreat provided a piling mat at both the upper and lower levels to enable the requisite piling works. The piling mats were constructed using imported recycled materials (6F5 ). Part of the site had been blighted with Japanese Knotweed, these were excavated and removed from site in full accordance with the Environment Agency Code of Practice. Validation Report (incorporating the MMP) was produced upon completion of the works enabling discharge of the relevant planning conditions. The remediation strategy as implemented provided a very cost effective remediation solution.